What features should you look for in a quality construction boot? If you’re ever asked yourself that question, you’re in luck. It’s definitely a question we’ve asked ourselves a few times which is why we researched some of the most popular and best-selling boots around to find out what makes a boot the best one for the job. Before we get into our products, let’s take a look at some of the key features you should keep in mind. Material: Leather is by far the best material for work boots. It’s tough, lasts a long time, and softens and molds to the shape of your foot over time. This provides you with the best comfort and support possible. Gender: While we found one pair of boots made especially for women, the truth is anyone can wear any of these boots. Just be sure to choose the right size since men’s and women’s shoes are sized differently. Color: A lot of these shoes are available in a few different colors but you’ll usually have to choose from standard neutral colors. We did find a handful of boots that come in different colors but they’re not the norm. Sole Material: Most of these shoes have either rubber soles or a synthetic material designed to look and feel like rubber. A good grip is important on the worksite so a lot of these are also oil and slip-resistant. Waterproof: There aren’t a lot of truly waterproof options on our list but we should mention that water-resistant and waterproof aren’t the same. Plenty of these boots are water-resistant and can deal with a little moisture. Type: These boots are available in 2 different styles, pull-on and lace-up. Both have their pros and cons. Pull-on boots are really easy to get on and off while lace-up boots give you more ability to adjust the fit. Now that you know a little more about how to pick a good boot, let’s get into our top picks. If you’re in a hurry, start right at the beginning with our top and budget picks. That’s the best way to get an idea of the variety that’s available. There are so many great options here, though, we hope you can stick around. So, what are the best work boots for construction? Let’s get started and find out. Our top pick is some of the best work boots for construction workers, the Red Wing Heritage Boot. This brand has been around a long time and this boot is actually styled after their original 1950s workboot and made with the same attention to detail and quality. 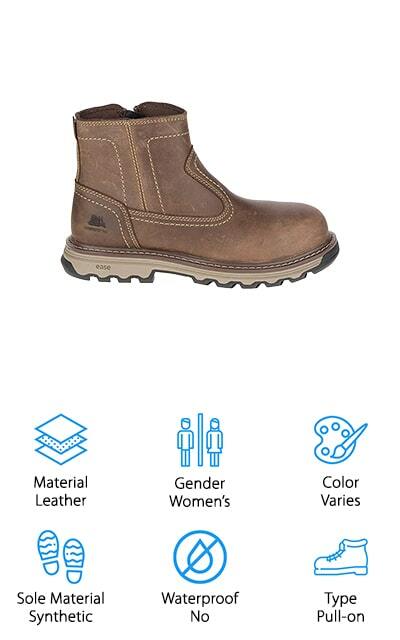 There are a lot of nice details that look good and make this a comfortable boot for the job site. 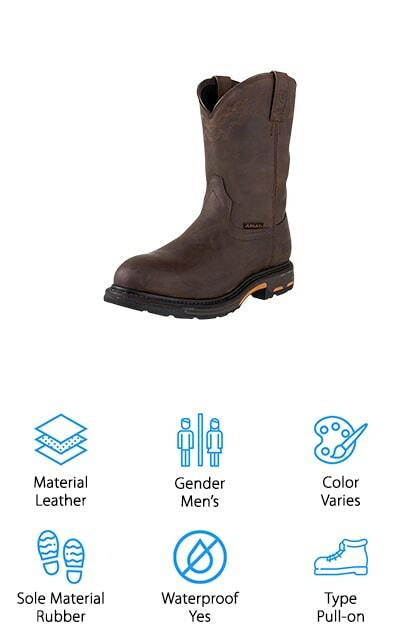 The 100% oil-tanned leather provides both comfort and protection and the tractor-tread rubber outsole provides the right amount of grip for most terrain. That’s not all, they’re made with triple-stitched construction and come with leather laces for just a bit more style. These shoes are designed to mold to your foot so the more you wear them, the better they’ll fit. Order a ½ size down for best results. If you want a pair of affordable boots that don’t have a lengthy break-in period, take a look at our budget pick, these Stanley Dropper Work Boots. They feature an oil, acid, and slip resistant outsole that helps you stay safe in treacherous working conditions. A 100% leather upper comes up to just below the calf to provide ankle protection while the inside is lined with mesh for comfort and a bit of moisture control. The TPU heel counter and EVA footbed provide the shock absorption, protection, and support you need. Plus, you can remove the insole if you have an insert that you like to make sure you’re as comfortable as possible while on the job. These durable boots are easy to clean and super lightweight so taking them to and from the job site is no big deal. When you think about the best work boots for construction, you might not immediately think of Dr. Martens, but you should. The iconic brand’s Icon Steel Toe Boot is a perfect example of why the brand if one of the most popular in the world. Not only are they approved to protect against falling objects and other job site hazards, but they’re also slip-resistant and electric-hazard resistant. In short, they’ll protect you from just about anything you’ll come across on a busy construction site. 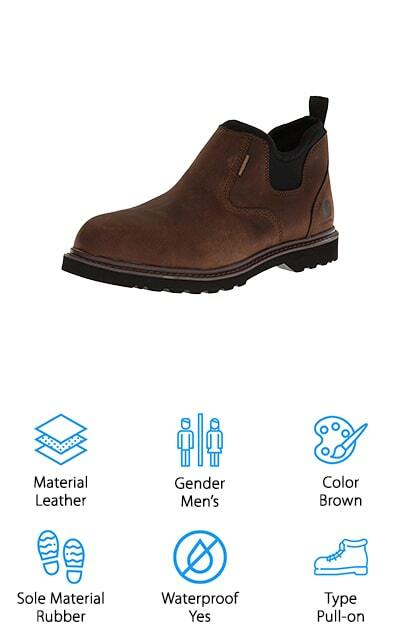 These boots feature a heat-sealed welted construction for longterm durability and super comfortable AirWave insoles that are soft, supportive, and provide all-day comfort. These pull-on boots are available in 6 different colors and feature pull-on loops on either side so they’re easy to get on, even before you break them in. Next up is the Golden Fox Work Boots. They come up to about ankle height and features a leather upper that’s available in 2 different shades of brown. 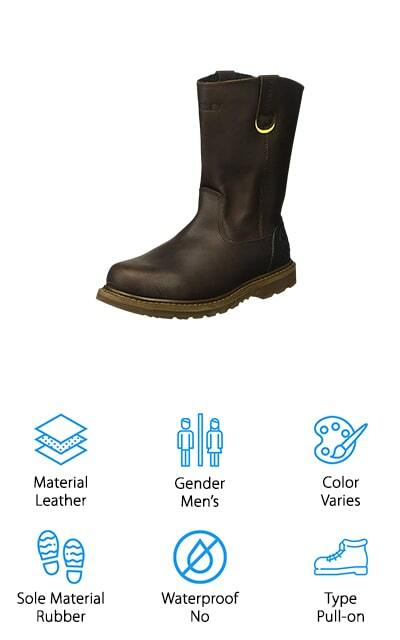 While the upper isn’t waterproof, it is water resistant so these boots will be able to take some splashes and rain. Keep in mind that the uppers are a little stiff at first. They’re meant to soften and conform to your foot over time for personalized support and a perfect fit. The insole is made of dual-density, anti-fatigue material for the utmost comfort while the shock-absorbing heel helps to support your legs and lower back to help keep away any aches and pains after a long day on the job. And get this, the outsole not only provide superior traction, but it also resists oil and chemical erosion. The Ariat Workhog Work Boot is a great choice if you’re looking for the best construction boots for winter. While they’re not insulated, they are waterproof and come up to just below the calf. Throw on some warm socks and you’ll be ready to work in even cold, wet weather. Plus, the abrasion and slip-resistant outsole keeps you on your feet even in less than ideal conditions. These boots are supportive, too. The ATS Max platform provides torsional stability so your feet don’t get tired. This also helps keep your body aligned properly which can help prevent aches and pains after a long day at work. This is a Western-style boot that’s actually stylish enough to be worn casually. It’s available in 3 different colors, 2 of which have intricate detailed stitching for a little bit of extra detail. One of the best work boots for construction is this pair from ROCKROOSTER. For one thing, they’re really comfortable. Inside, they have NANO technology cushions that actually massage your feet as you walk which not only provides support but also helps keep away fatigue. Inside, antimicrobial protection in the insole helps prevent any nasty foot odors, something that you’ll appreciate at the end of a long day. The outsole is pretty awesome, too. It’s made of TPU rubber and is slip-resistant and designed to provide superior grip. And get this, the sole also contains a puncture-resistant Kevlar plate so you don’t have to worry about any injuries from stepping on a nail or other sharp object. These boots also feature a composite toe cap that’s anti-corrosive and helps to protect your feet against extreme temperatures. Up next are these construction boots from EVER BOOTS. This is a great pair if you want something that’s durable enough to wear to work but stylish enough to wear out and about when you don’t have time to change after work. The full-grain leather uppers conform to your foot over time for the perfect fit and supportive comfort but, honestly, they’re even comfortable right out of the box. 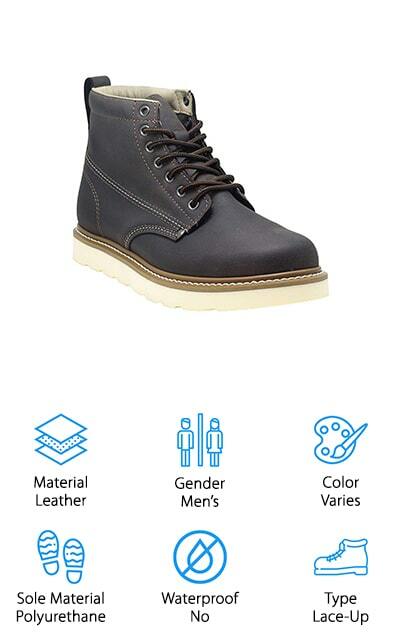 These boots use Goodyear Welt Construction and reinforced stitched toes so they’re really durable. You can even replace the sole if it wears out before the rest of the boot. 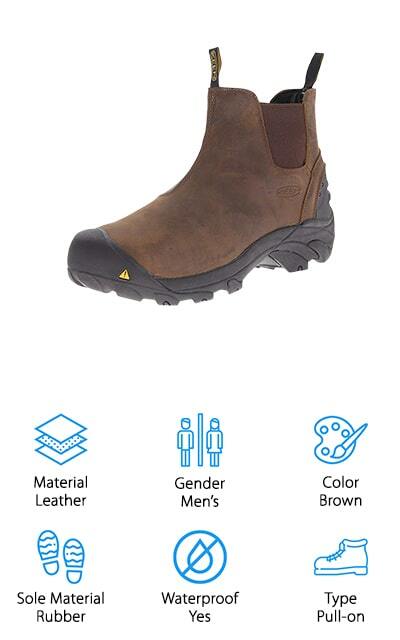 The sole it comes with is oil and slip-resistant so it’s a great choice for jobs with exposure to inclement weather or slippery surfaces. One more thing, these shoes are covered by a 3-month warranty. Some of the best work boots for concrete construction are these Keen Utility Work Boots. The upper is made of 100% waterproof Nubuck leather and has a hydrophobic lining to make extra sure your feet stay dry. Inside, the EVA midsole provides dual-density support while a torsional stability shank keeps away fatigue for fewer aches and pains at the end of the day. The footbed is comfortable, too, but it can be easily removed if you have a favorite insert you want to use instead. These boots also feature asymmetrical steel toes to protect you from any number of workplace hazards as well as an oil and slip-resistant rubber outsole for safety and stability. One more thing, the pull-on style is quick and easy to get on and off, too, thanks to the elastic gore side panels. A really awesome pair of slip-on work boots is the Carhartt Romeo Pull-On Boot. They’re also one of the most stylish boots we included on our list. You can actually wear these as a casual shoe if you wanted to but they are definitely tough enough for the job site. First of all, they’re waterproof which makes them great for wet or muddy floors but keep in mind that they are a low boot that comes up to the ankle so you probably shouldn’t submerge them. This boot also features high-quality, bonded welt construction that provides both flexibility and durability. The upper is made of a combination of oil-tanned leather and neoprene so they’re really durable and easy to get off and on while the cushioned insole helps your feet stay extra comfortable. Last up are the best construction boots for women, the Caterpillar Fragment Nano Boot. You might recognize the name Caterpillar as one of the bigger manufacturers of earthmovers and other heavy equipment. So, if anyone knows what it means to be tough on the job site, it’s Caterpillar, and their work boots really live up to the brand’s name. 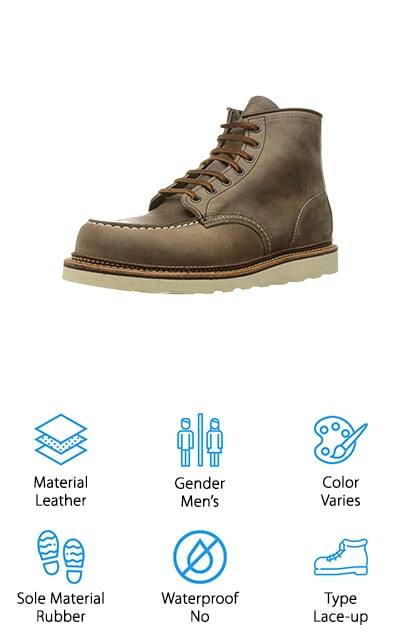 These boots have a 100% leather upper that comes up to right above the ankle. They feature composite safety toes made of carbon fiber and are electrical hazard rated for additional safety. Inside, advanced cushioning technology delivers the support you need for all-day comfort and a side zipper makes getting them off and on a breeze. The slip-resistant outsole has an aggressive tread for good grip on any terrain. One more thing, they’re available in 3 different colors: black, sable, and tater.